Getting to sleep has always been a difficult thing for me. I usually hate those hours spent anxiously trying to drift off but when the phone rang late one night a few weeks ago I was pretty happy that I was awake to answer the call. 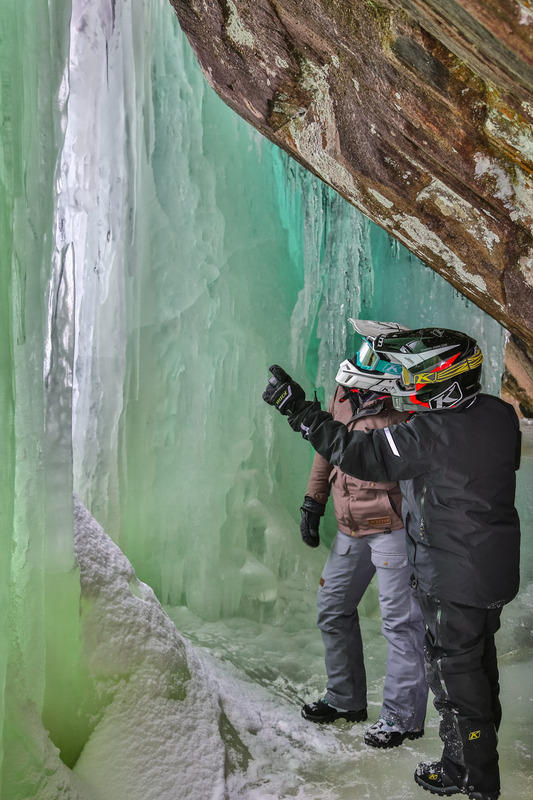 It was an invitation to take part in a trip to ride Northern Ontario with KLiM gear for a week. 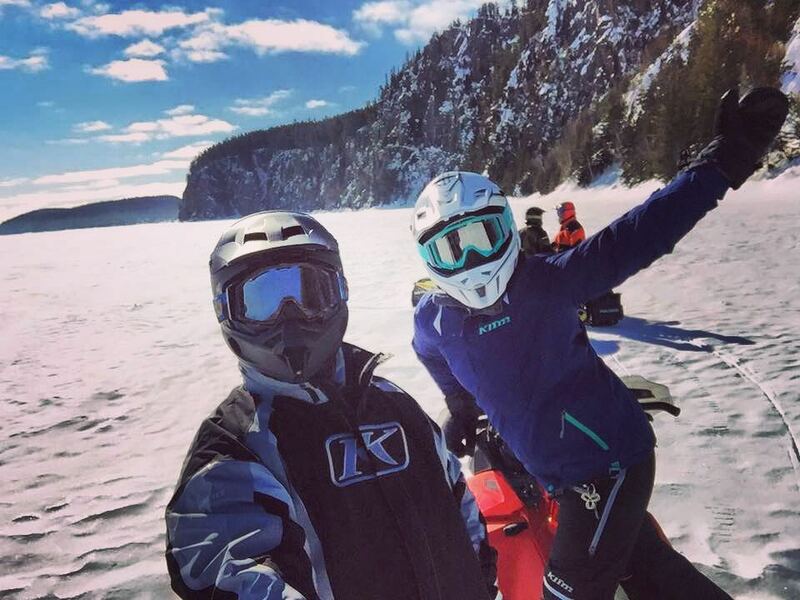 I instantly responded with “Yes I’m available!” Having never being invited to do such a trip, let alone spent any time on a sled in Northeastern Ontario before, I was all over it! For the rest of night I was up and dreaming about those famed snowmobile trails of the north. 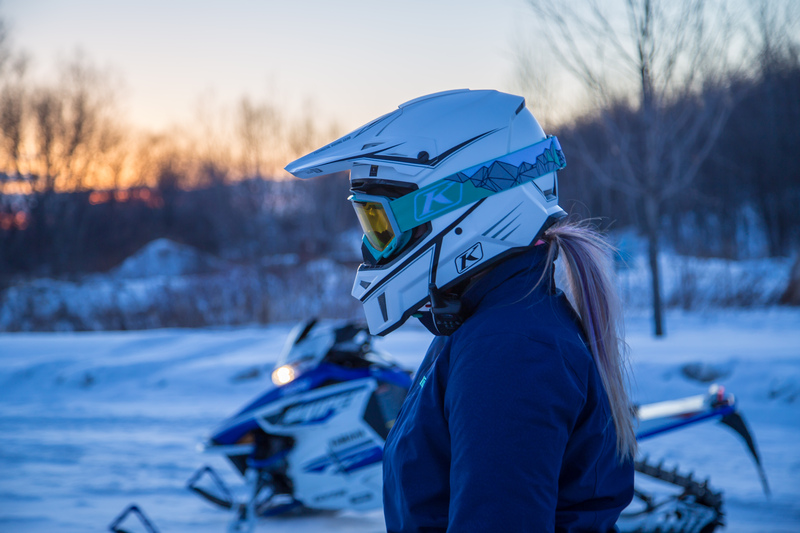 I spent Sunday morning packing some clothes and prepping my 2016 Skidoo Freeride, making sure it was fuelled up, the oil was topped up and loading it onto the back of my truck. Then I was off! Our main hub for the week was the Clarion Resort Pinewood Park in North Bay. 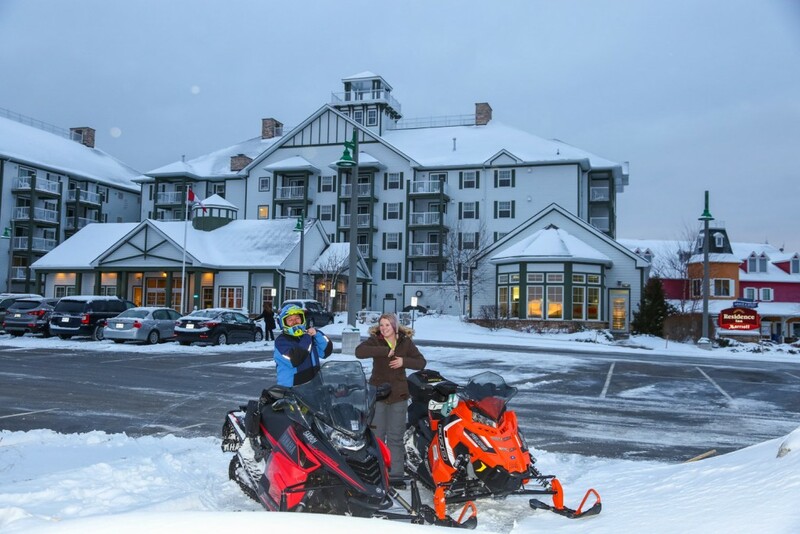 It was the perfect staging location for a sled trip in Northern Ontario with comfortable beds, amazing food and a cute snowmobile corral around the hotel so you can literally ride straight to your room. First thing Monday morning we got right into it riding in New Liskeard / Temiskaming Shores. 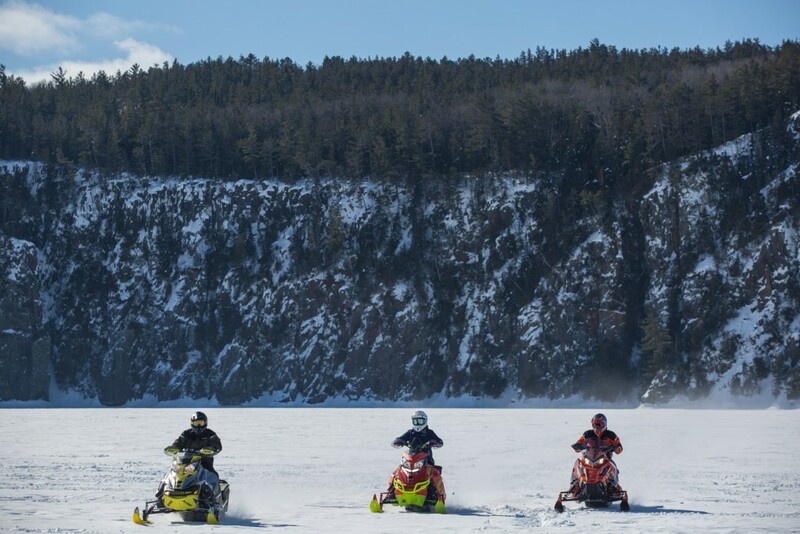 It had a been a cold winter—it always is when you go this far north—so we rode across historic Lake Temiskaming for an epic hangout near Devils Rock which was absolutely unreal. I have never seen a rock face that big before, it puts the Hole in the Wall on Georgian Bay to shame. We then got a much needed lunch and warm up at Roosters, which was conveniently accessible via snowmobile. Our afternoon consisted of riding trails in the New Liskeard area and taking some pictures with the famous “Ms. Claybelt the Cow” along the highway. Tuesday we were riding in Sudbury. 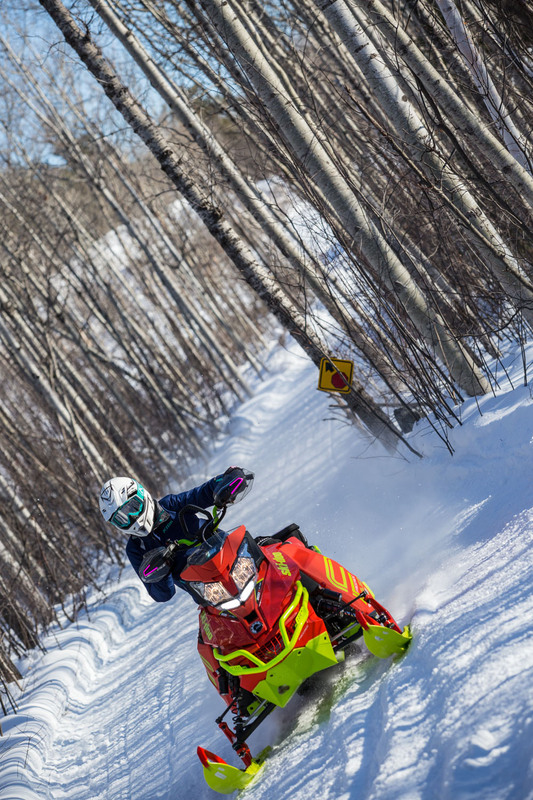 I had only been to “The Nickel City” for school related things, never to ride sleds so I was pretty excited to see what the area had to offer. We left bright and early first thing in the morning. I needed an energy drink to get through it but got into the groove of things once we were on the sleds. 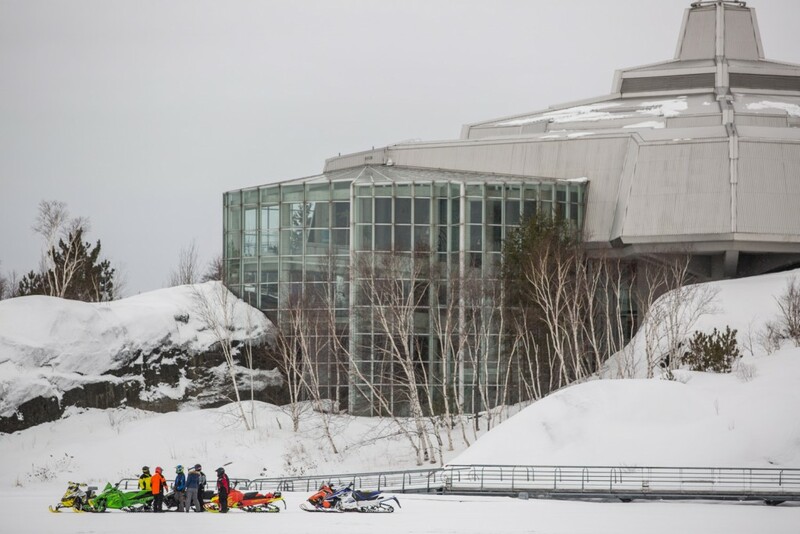 The first part of our day we got to ride on Ramsay Lake, right in front of Science North. It was really cool to see Science North from a different perspective other than the parking lot. We spent the day till dusk riding just north of Sudbury near Hamner. I loved it, the trails were smooth, wide and it was nice to see some more mountainous scenery. In addition to great riding and trails in the Sudbury area, we got to ride with Canadian country singer Larry Berrio. As our guide for the day, he showed us as many great riding locations as he could and he is one of the nicest guys I have ever met (he also RIPS on a sled!). Wednesday was my favourite day. We rode into Mattawa and I LOVED it there. It was so beautiful that I’ve already begun making plans to go back and ride dirt bikes and ATVs in the summer. I’d never been to Mattawa before; I actually didn’t realize that such an awesome area was so close to North Bay. Mattawa was my favourite riding location of the week. It’s difficult to express in words how much I loved it there. 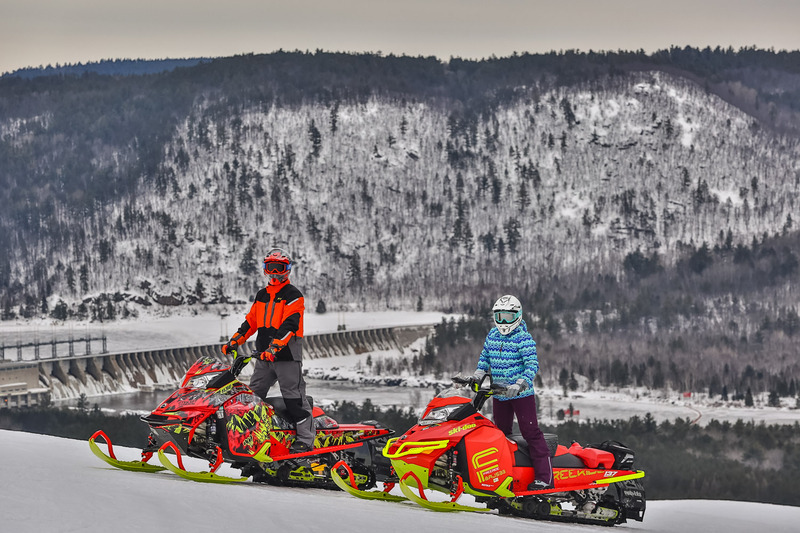 When we first arrived I was in awe of the mountainous scenery, my phone was out snapping pictures and I was so excited to unload the sleds to get riding. We spent the morning and into the afternoon at Antoine Mountain, a ski resort in the area where we got to hangout on top one of their ski hills. The view from the top was amazing; it looked over the Ottawa River and the province of Quebec. We ate lunch in the cozy lounge at Antoine Mountain where I had the best hot chocolate of my life—seriously if you go there get the hot chocolate, it’s so good. The rest of the day we rode the Mattawa trails which were winding and hilly, challenging at decent speeds yet easy enough for a beginner rider. Thursday was a close second when it comes to favourite riding locations. 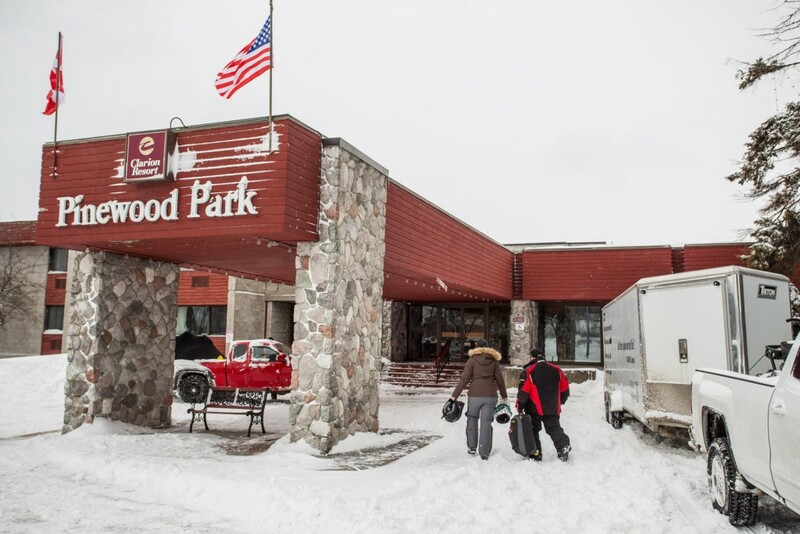 We staged at the Edgewater Park Lodge in Kearney, a cute resort along the shores of Sand Lake complete with fuel, restaurant, ample parking and cabins for snowmobilers. Wednesday night delivered a fresh blanket of snow that the groomer hadn’t had time to go over yet so our tracks were the first ones touching that pristine powder—an awesome feeling as any sledder knows. With direct access from the Edgewater, we spent the morning and the first half of the afternoon flying along the trails around Kearney. 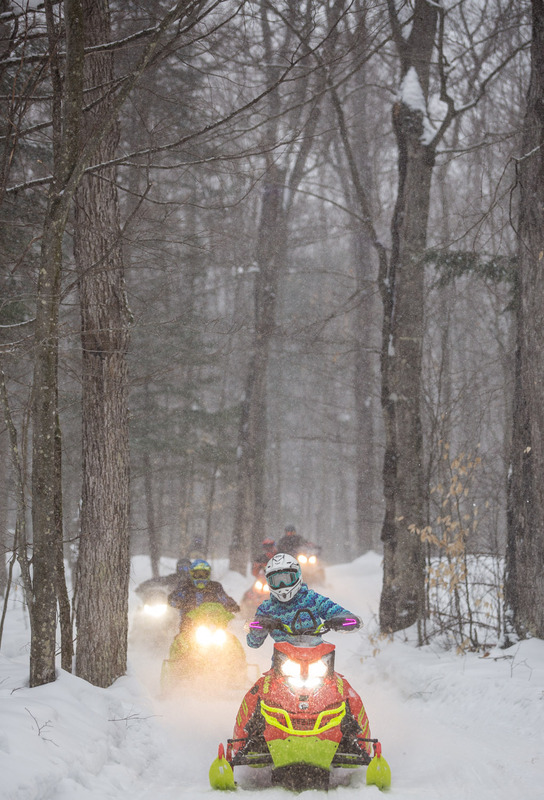 They reminded me of the Muskoka-Parry Sound trails that I am used to riding—a lot of fun! We headed out to a small lake in the area to check out some ice caves off the trail. They were so beautiful! Apparently most winters see them grow even larger than what witnessed that day. 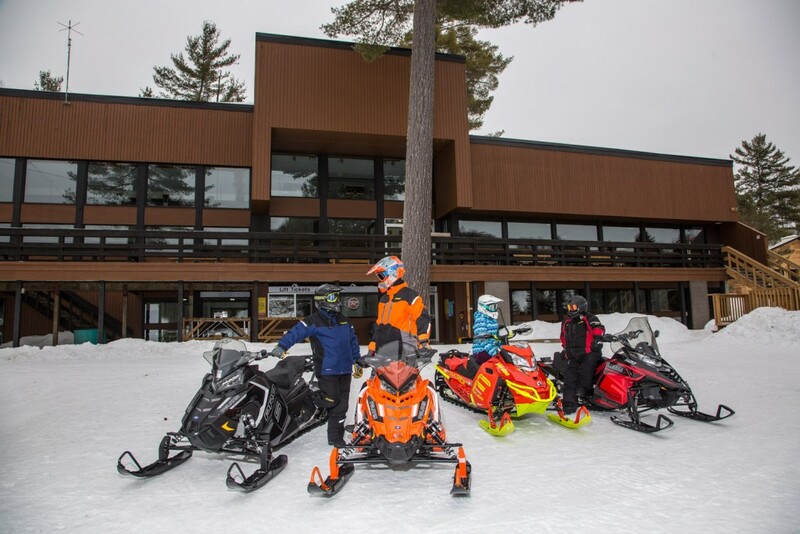 After a great lunch at the Edgewater Park Lodge we loaded up the sleds and headed south to Gravenhurst where we ended our trip at the Marriot Residence Inn on Lake Muskoka. It was a week of first impressions. 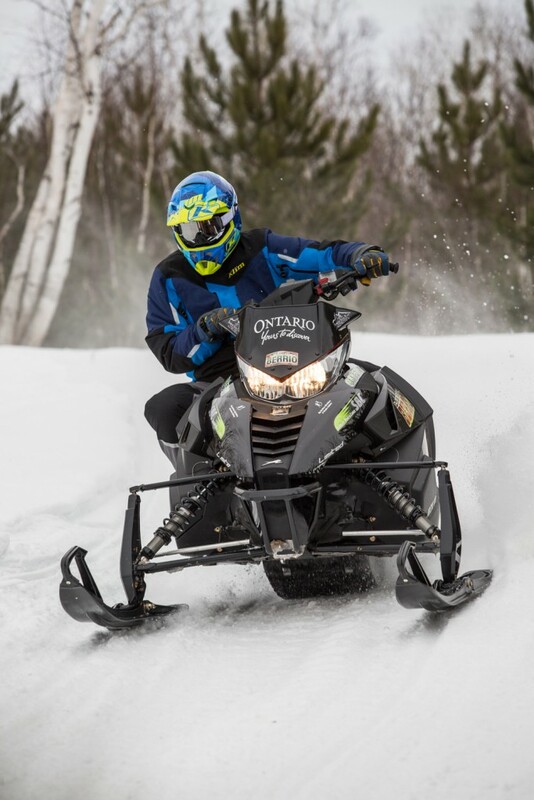 Riding in Northeastern Ontario was amazing and I cannot wait to trailer up again next season. It was also my first time wearing Klim gear and, as someone who always has cold hands and feet, I was pleasantly surprised at the warmth and quality of the Klim gear. 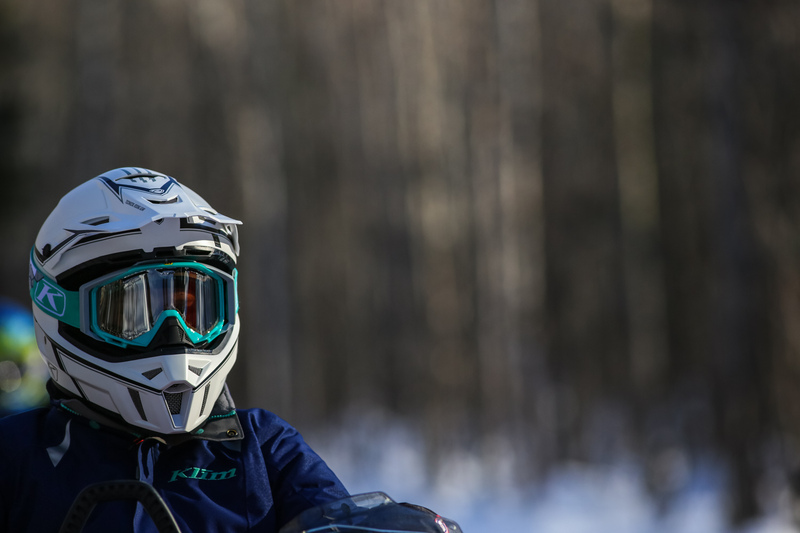 My most favourite Klim item I tried was was definitely their new F3 helmet. I wore all week, it was pearly white and SO comfortable and warm, I wanted to keep it! 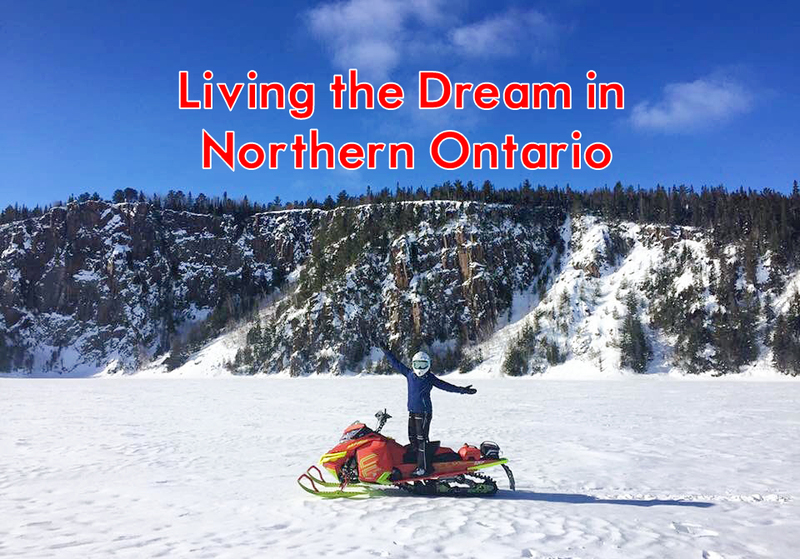 Northern Ontario has so much to offer—the kindness, hospitality and overall snowmobiling experience was second to none. With the difference in snow conditions between Southern and Northern Ontario, it was almost as if we were travelling to a different country. Heading to Northern Ontario for a last snowmobile adventure of the season was hands down one of the best choices I have ever made. I’m already dreaming about going back next year! 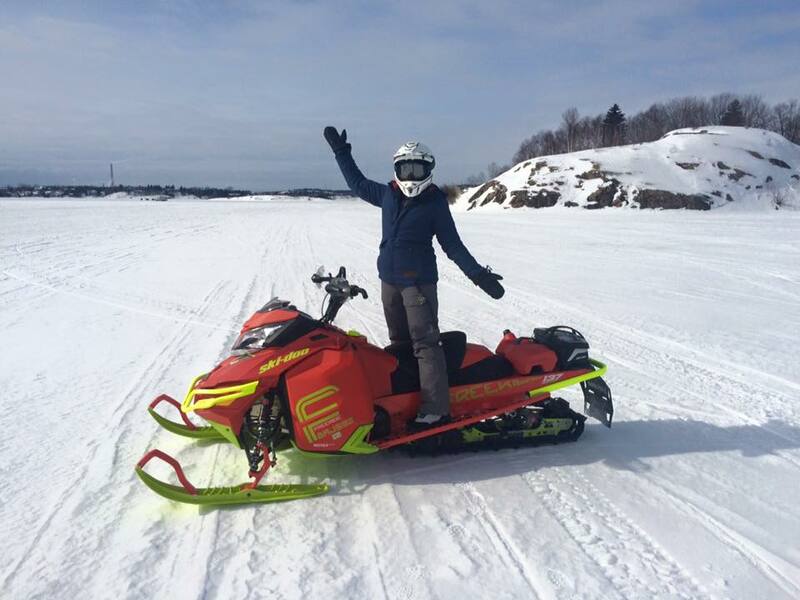 I am a lifelong gearhead who grew up in northern Ontario, with a passion for virtually anything with a motor. I am the Public Relations and Communications director for the International Women’s Diesel Association and have my Honours Bachelor of Arts in Psychology.